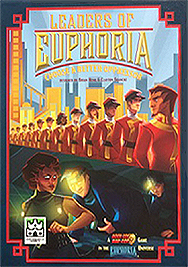 The Euphorians are brainwashing survivors to convert them to loyal workers that will maintain their extravagant city. Meanwhile, the Subterrans are emerging from their tunnels to claim the city for themselves. In order to stay within the city's wall you'll need to be loyal to the faction that your Recruits support. ...WILL YOU CHOOSE A BETTER OPPRESSOR?